If you have a question that's not answered here, please fill in a form on the contact page. Where can I buy a Miller Surfboard? Miller Surfboards can only be ordered directly from Grant Miller. Either call Grant on 0410770374 or email him through the contact page of the site. Normally he will respond to your email within 24 hours, sometimes sooner. Why can't I buy Miller Surfboards from surfshops? Discussion by Grant Miller: “In the past, our boards were available through 8 different surfshops in the Sydney metropolitan area. Each shop would have anywhere between 6 and 20 of our boards. However over the years I gradually cut down the number of shops who we supplied. Why? There were a number of important reasons which are detailed below. Shops generally sell what they have in stock rather than what may be best for a customer. Often I would take calls from people who had bought one of our boards from a shop and were having some drama. After carefully listening to the person, it would be obvious to me that the board was too big/small or that the fins supplied were not appropriate for the board or that it was the wrong model. The surfer sometimes thought that there was something wrong with the actual board when there wasn't. It just wasn't the right board for them. At times, it was inconceivable to me why the person in the shop had sold them that particular board in the first place. Even a basic consultation over the phone revealed the mismatch between surfer and board. I realised over time, that shops would rather sell any board than no board. Or, they couldn't be bothered/ or were not skilled enough to take a custom order when necessary. Because it's very important to me to get each surfer on the best possible board, I would then call the shop concerned and try to broker some sort of a deal on the client's behalf. This normally meant building them a custom and them trading back in the stock board to the shop. However over time, the shops would just get customers to call me directly to speak with me. Naturally this could be very time consuming. Over time, I formed the view that very few people who worked in surfshops were sufficiently competent to accurately assess a surfers needs. Either they lacked the technical knowledge, or they just didn't really care. Sometimes it was both. This is a very serious and ongoing problem when buying boards from shops. Theoretically, the best person to deal with in a surfshop would be an ex shaper (assuming he were competent). But why would a competent and successful shaper want to work in a surfshop? Give that some serious thought. Shops generally want to order stock boards with lighter glassing because lighter boards feel nice when you pick them up. I also think that in some cases, shops prefer this because the boards will fail sooner in use and so they get to sell more boards. I'm serious. I do not agree ethically with building boards designed to fail early. So, I'd glass our boards durably and the shops would complain. Sometimes I'd have shops calling me to complain about an apparent construction failure. For example they may have sold a board which was glassed a bit lighter to a very heavy surfer and the deck would naturally be badly dented. You can imagine the dramas. Then there was curing. I'd personally deliver stock to shops and specifically tell them that the boards were very fresh and thus not fully cured. (New boards take about 2-3 weeks after glassing to cure and reach maximum strength.) I'd remind them to advise anyone buying one of these boards to wait a while before riding them. Yeah right. You can imagine staff doing that can't you? Again, potentially those boards could be ridden too early and then dent up excessively, which reflects poorly on us more so than the shop. Shops do not always pay their accounts on time. Lets just say that this was another regular source of friction. So, after approximately 12 years, I stopped supplying shops altogether. They still contact me from time to time wanting boards, but my answer is always the same. Certainly I could sell more boards and make more money if I sold to shops. However these considerations are not as important to me as quality. So, if you are looking for a beautifully crafted surfboard which suits you perfectly, I would be very happy to hear from you. Shipping is not included in the baseline board price. Approximate Freight prices (Australian Dollars) to popular destinations. Grant will give you an exact freight cost at time of ordering. Australia: $50--140 with TNT Couriers/Remote areas POA. New Zealand: $300---350 with TNT International. United States: $300---350 with DHL Couriers. United Kingdom: $250---300 with DHL Couriers. We recommend that you insure your board for it's journey. Additional cost $30. It is highly preferable to have your board freighted to a business address which is open between 9am and 5pm Monday through Friday. If we freight to a domestic address and no one is home, then TNT will return the board to their nearest depot and charge a $20 redelivery fee. Apart from this, obviously the more handling which occurs, the greater the potential risk of damage. It is not possible to predict with certainty exactly which day delivery will occur. Therefore it is in your interests to come up with a business address if at all possible. This address might be that of a friend or associate for example. We cannot freight to PO boxes. How do I get my new board? Pick up in person at Little Forest (near Milton) by prior arrangement with Grant. Have your board freighted with TNT (approximate rates above). For clients in the Sydney metropolitan area the average cost is around $80 plus optional insurance (see above). Have your board hand delivered to your work or home address by Grant anywhere within the Sydney metropolitan area/excluding downtown CBD: Delivery range-Campbelltown-Hornsby-Palm Beach-Cronulla and anywhere South to Wollongong for $50 (insurance not necessary). Multiple boards ordered by the same person will be charged $50 in total. You can discuss these options with Grant at the time of ordering or when your board is close to being finished. All Miller surfboards come supplied with appropriately sized fins and fin removal key. Primarily we manufacture our surfboards using the Surfinz system. We strongly endorse this system since it is significantly stronger and provides more adjustment than any other system. Importantly, the Surfinz system is perfectly compatible with traditional two tab FCS fins, although the manufacturers are entirely separate from FCS. Therefore, if you already own FCS fins which you like, they can be used with a perfect fit in your new board. Additionally, the fins which we provide you with are identical to the M3, M5 and M7 FCS templates, and so individual replacement fins can be obtained from most retailers worldwide in case of breakage. However, on request we can also install either FCS or Future Fins when building your new board. Feel free to discuss these matters with Grant at time of ordering. We also provide traditional fin boxes on request. For example, if you are ordering a midlength single fin board. At times people also order Waterskates with a fin box in the middle and Surfinz at the sides. Additional cost for a finbox is $50 plus the centre fin @ $60. A dedicated quad fin has 4 fin plugs and attracts an additional cost of $40. 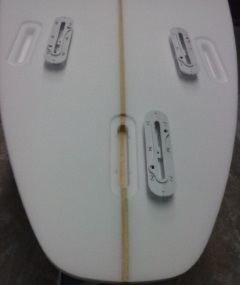 This option comes with 5 fin plugs and allows the board to be ridden as either a Thruster or a quad fin. Additional cost including fins is $80. Baseline price is for a clear board (except the Powerglide which comes with a dedicated spray as seen here). Colours are extra. All our boards are sprayed by Martyn Worthington, a professional with over 40 years experience in the industry. "I first worked with Martyn at Hot Buttered Surfboards when I started shaping in 1979. Our close collaboration ensures that whatever your color requirements may be, we will meet your expectations". Perhaps the most talented and experienced airbrusher in the Australian surfboard industry, Martyn has been working on my boards off and on for the past 35 years. Anything from beautiful colour fades to balsa-wood look a likes, to matching unique colours and complete murals, nothing is too difficult for Martyn. If you decide to have your new board colored you will be blown away by the result. See sample sprays . Detailed sprays/graphics - price on application. All our boards are glassed and sanded by Steve Zoeller at Mona Vale. Steve and I have worked together for the last 13 years and have a very close working relationship. Steve has been glassing boards for more than 40 years. For many years he worked with Simon Anderson building Energy Surfboards after Simon released the Thruster in 1981. Like Martyn, Steve is a world class craftsman, absolutely committed to the highest standards. He uses many subtle techniques, learned through long experience, which cumulatively result in a superior board. The contrast between boards built like this and those imported from Asia is like night and day. GLASSING SPECIFICATIONS. Since we are no longer prepared to supply boards to retail shops and do not build stock boards, all Miller Surfboards are custom made. As a result we do not use a standard or fixed glassing schedule. Rather, each board is individually glassed and built to suit the requirements and expectations of our clients. Grant will carefully discuss the various glassing options with you at the time of ordering. To give you some idea of the build quality we routinely achieve, it is quite common for clients to trade in Miller boards which are 4-5 years old, and which have been used consistently throughout that time. Putting this into perspective, most commercially available surfboards today are lucky to last 18 months before either terminal breakage or other material failure finish them off. I feel very proud to have Martyn and Steve working with me, and in addition to be able to count them as personal friends. If you would like to incorporate your own artwork, graphics or company logos on your new board, this can easily be arranged. We can provide finished artwork of any size and colour to suit your requirements. Your artwork is printed onto professional quality rice paper with fade resistant inks, and is then laminated under the fibreglass of the surfboard during manufacture. You need only provide us with the artwork on a file via email. Prices begin at $40 per image. Grant will happily provide you with an obligation free quote whilst you are ordering your new board. Either by EFT or cash. International orders by international telegraphic transfer. Careful scrutiny of our website reveals that everything we do, from initial ordering, through shaping, spraying and glassing, is done thoroughly and to the highest possible standard. This is why our boards take longer to build than other brands. We care, and our boards are not mass produced or rushed. This is why Grant enjoys such a high rate of repeat business and referral. It also explains why we essentially never have construction failures. Our boards are certainly worth waiting for. How long will it take until I receive my board?